shortstuff wrote: thanks, i got your PM! ok so i watched it ( ended up watching the whole movie AGAIN... ) and then i backtracked and watched that part again..
it seemed to me that he didnt actually mouth the words 'i love you', but rather, opened his mouth as if there was more he wanted to say.. and then decided to just leave it at that. i think someone else explained it well.. that it was almost a tortured whisper.. like he really WANTED to say it, but couldnt bring himself to even go there..
You're welcome! Yeah, it's kinda driving me nuts, I've watched it a lot online and just saw it again in the theater with my friend yesterday and she said she thought he did. Maybe you're right and he is just supposed to want to say it, but not completely mouth it, we're just supposed to know that he wants to, ya know? *sigh* Someone get Rob on the board so we can ask him! 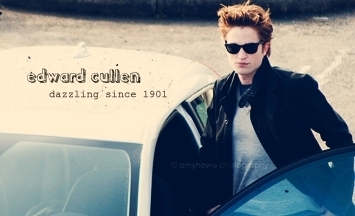 TeamEdward1918 wrote: You're welcome! Yeah, it's kinda driving me nuts, I've watched it a lot online and just saw it again in the theater with my friend yesterday and she said she thought he did. Maybe you're right and he is just supposed to want to say it, but not completely mouth it, we're just supposed to know that he wants to, ya know? *sigh* Someone get Rob on the board so we can ask him! While I'd LOVE to find Rob on the Lex, I somehow suspect that any quality questions we might ask would, unfortunatley, be lost amongst all the fangirl squeeing!! I really cannot wait to listen to the DVD commentary. Although, I don't know that I'll want to listen to someone talk over the movie, even if it is Rob or Kristen or Catherine. Every time I see the movie, I just about have a stroke any time someone so much as sniffs. That doesn't make me obsessed or anything, does it? I'm such a dork; I love to listen to DVD commentary of movies that I like. I always find it interesting to hear the perspective of the director and cast on how and why certain scenes were shot a certain way, what was going on behind the scenes, etc. ["thanks, i got your PM! That's what I thought the first time I looked closely, but no, after Edward opens his mouth like he is struggling to say something, and right before Bella is whisked away he mouths "I love you" really fast. twilightnewbie wrote: That's what I thought the first time I looked closely, but no, after Edward opens his mouth like he is struggling to say something, and right before Bella is whisked away he mouths "I love you" really fast. Like I said folks, it is my absolute favorite moment of the movie. The relationship between Rob and Kristen as Edward and Bella just...works. There is something so intense between them. There is another moment, right before the I Love You that brings me a similar reaction. When the family walks into the garage and Jasper and Emmett are talking about killing James. Edward and Bella walk in last, Edward's arm is around Bella's shoulder and she is holding his waist. There is something about the way they are physically oriented with each other, the way she is perfectly able to tuck herself into him. And, then, when Alice says she and Jasper will take Bella south, and Alice almost takes Bella from him, as Bella is moving from his side to Alice's, his body kind of arches towards hers, as if she literally is being ripped from his side. It's just one of those microscopic moments that brings you completely within that heartbreak again and again. Amazing. Jazz Girl wrote: Like I said folks, it is my absolute favorite moment of the movie. The relationship between Rob and Kristen as Edward and Bella just...works. I love the intensity of this scene as well, and your description of it is just spot on, Jazz Girl. I do have one question about the scene that I meant to ask a Twilight-obsessed friend after we saw the movie together, and then I forgot. I think it's at this point in the movie that Edward says something to Alice about not wanting to hear her thoughts, or something along those lines. (Sorry, I haven't seen the movie in over a month and my specific recollection of the words are a little vague.) Is Edward referring to not wanting to see Alice's vision of future Bella as a vampire, or something else entirely? Thanks for any help clearing this up for me!